Over the past 50 years, changes in the labor market have put pressure on workers to attain at least some education or training beyond high school. Those who lack post-secondary training often struggle to find employment, and when they do, have limited opportunity to move beyond low-wage, entry-level positions. This is particularly true in Baltimore, where many residents have either dropped out of high school, or completed and gone no further – and suffer from high unemployment and low wages as a result. Half of all city adults have no more than a high school credential. Among the lowest educated workers – those without a high school credential – more than 25 percent are unemployed, and many more do not participate in the labor force at all. Wages remain low for those who do work, with half of city earners taking home less than $33,000 per year. For those without a high school diploma, average wages come to about $20,000. 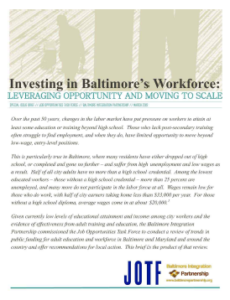 Given currently low levels of educational attainment and income among city workers and the evidence of effectiveness from adult training and education, the Baltimore Integration Partnership commissioned the Job Opportunities Task Force to conduct a review of trends in public funding for adult education and workforce in Baltimore and Maryland and around the country and offer recommendations for local action. This brief is a product of that review. This paper argues that we need to find new ways of working together to help more Baltimore residents access quality employment opportunities, and to advance economic development by ensuring that employers have access to a skilled, reliable labor pool. It begins by highlighting the scale and nature of the city’s workforce challenge, focusing particularly on its struggling adult workers. It then describes how and through what organizations and mechanisms workforce training resources are allocated, and how declining funds are impacting their capacity to train residents and help place them into jobs. The report provides a series of recommendations for how existing resource constraints might be overcome, citing examples of promising models employed throughout the country from which Baltimore might learn – many of which are built on a foundation of strong employer engagement. By doing so, the Baltimore Integration Partnership and the Job Opportunities Task Force hope to stimulate new thinking about how public, nonprofit, and private sector stakeholders can work more collectively and effectively to create a workforce prepared to meet the demands of a 21st century economy – today, and in the decades to come.